The right to brag that you are eco-friendly! With irrigation systems that deliver exactly the right amount of water at the right time to lawns, plants and trees, you can be assured of environmentally sound and efficient results. Way to Grow Irrigation offers reliable options and affordable technology for water conservation and efficient water distribution to protect landscaping investments. As necessary as a light saving bulb that cuts electricity by 90%, So does automated irrigation system with water savings of up to 80% more effective then hand watering, and just as necessary! With installations ranging from residential, commercial, sports fields, resorts, or public parks we have the means to provide state of the art components with service that is second to none. Our clients enjoy peace of mind knowing their systems automatically get started in spring and shutdown in the fall eliminating the need to call for service and is our standard procedure. Way to Grow Irrigation believes that your system should not be on your mind so we create a hassle free experience, taking care of your system for you. We offer state of the art services like off-site monitoring which enables us to remotely monitor your system, provide usage reports, and the ability to change the programming of your system from our office. We also offer weather based control or smart controllers that water each day according to "actual" weather conditions which virtually eliminates the need for human interaction regarding programming, while saving you 20%-60% off your water bill. Combine both off-site management and weather base control, and you would have the ultimate irrigation system using minimal water providing a healthier landscape and total assurance that Way to Grow Irrigation is taking care of your system. The Canadian Shield has challenged Muskoka and surrounding area with unique landscapes ranging from rocky terrain, acidic soils, variety of trees, and an abundance of bedrock. This creates unique micro climates that need to be assessed and calculated for each property. For this reason, Way to Grow Irrigation assesses the local environmental conditions on each site and provides different methods of installations. 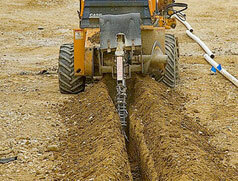 Way to Grow Irrigation has the equipment and experience to install your system with whichever method best suits your project, regardless of size and scope. 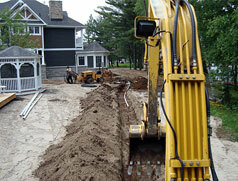 Muskoka and surrounding area is teaming with water sources like lakes, ponds, rivers, and even swamps. 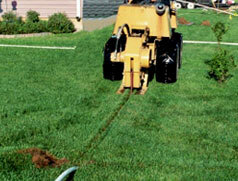 Way to Grow Irrigation has specialized knowledge in pumps designed specifically for your irrigation system. Our goal regarding pump work is they must work quietly and efficiently as not to disrupt the peace and tranquility that is sought after in this region. Way to Grow Irrigation enables you to water your landscape with practical solutions, utilizing the latest technologies in water management, thus minimizing the impact on our environment.